Newly elected APC lawmakers must tow the party line or be whipped out of the party, Bola Tinubu has said. The All Progressives Congress (APC) national leader said that party discipline would be upheld in addressing the leadership tussle of the 9th National Assembly. 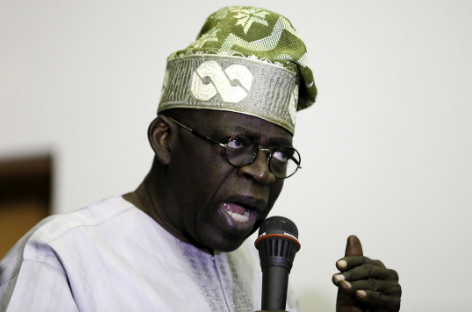 Tinubu said this while speaking with journalists in Lagos on Friday after a prayer programme organised by Islamic and Christian clerics to mark his 67th birthday. “It is either you stay with us or you follow us or you leave. You have the freedom to choose but the freedom does not give you as a minority to go and collaborate and protrude our mandate given to you to another party who was our opposition and who is still our opposition. We would not take that this time, no matter who you think you are. "That is how it is built. Why do you want to deviate from what has been structured? We look at our reward system equally, zone by zone,” he said. The APC leadership recently declared support for Yobe senator, Ahmed Lawan to become the next Senate President. Lagos lawmaker and Mr Tinubu’s protege, Femi Gbajabiamila, was also endorsed to become the Speaker of the House of Representatives. The move was condemned by other APC lawmakers including Borno senator, Ali Ndume, who seeks to be the Senate president. Ndume has vowed to continue with his ambition, saying he enjoys the support of many of the elected APC senators. A Gombe senator, Danjuma Goje, is also in the race and has the support of Senate President Saraki.